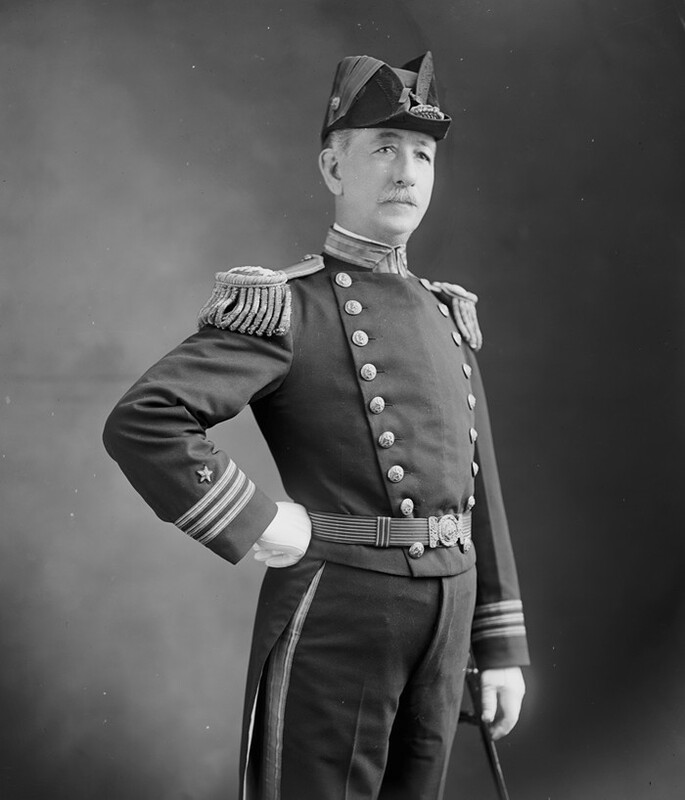 Captain Washington Irving Chambers, USN (1856-1934) was a United States Navy officer who played a major role in the early development of Naval aviation, serving as the first officer to have oversight of the Navy's aviation program. Chambers was born in Kingsport, New York in 1856 and graduated from the United States Naval Academy in 1876. He served in various sea and shore billets from that time onwards, including on the celebrated Greely Relief Expedition under Winfield Scott Schley. In 1907-09, he was Assistant Chief of the Bureau of Ordnance. Later on, he was placed in charge of the development of aviation in the Bureau of Navigation. Among his other accomplishments, Captain Chambers arranged for the first take-off and landing of an airplane on a ship, pioneered work on torpedoes, and submitted one of the first American designs for an all-big-gun battleship. Chambers Field in Norfolk, Virginia, dedicated in June 1938, was named in his honor. Secretary of the Navy Donald Winter announced today the names of four new Lewis and Clark-class dry cargo/ammunition ships (T-AKE) as Mathew Perry, Charles Drew, Washington Chambers and William McLean. All of the Lewis and Clark ships are named in honor of American explorers and pioneers and are being built by General Dynamics NASSCO shipyard in San Diego, Calif. The selection of Washington Chambers, designated T-AKE 11, honors Navy Capt. Washington Irving Chambers (1856-1934), a pioneer in naval aviation. Responsible for the Navy's nascent aviation activities, Chambers arranged the world's first airplane flight from a warship. The Nov. 14, 1910, flight by aviator Eugene Ely on the light cruiser the USS Birmingham (CL-2) confirmed the potential of carrier-based naval aviation. T-AKE 11 will be the first Navy ship named after Chambers. NEW ROCHELLE, NEW YORK, July 26, 1945 - Mrs. Isabella Reynolds Chambers, widow of Captain Washington Irving Chambers, United States Navy, who played a leading role in the invention of the naval airplane catapault, died today in a nursing home here. She had been ill for two years. Her age was 83. Captain Chambers died in 1936. Born in New Brunswick, New Jersey, Mrs. Chambers leaves a son, Captain Irving Reynolds Chambers, U.S.N. ; two sisters, Mrs. Catherine H. Westbrook and Mrs. Frank Maden of Brooklyn, New York, and a brother, Louis F. Reynolds of Kingston, New York.